Use Halloween Snickers Leftovers in this Yummy Apple Dip! When it comes time to use the leftover Halloween candy, we’ve got the perfect recipe for you to try. This yummy apple dip uses Halloween Snickers Candy Bars to give you a little taste of chocolate and caramel. It’s perfect for enjoying as a special treat after school or for serving up at a party. Here’s how to make it – it’s so easy! Start by taking two 8 ounce packages of cream cheese and letting them soften gently. Beat the cream cheese until creamy with about 1 teaspoon of vanilla, 3/4 cup of brown sugar, 1/2 teaspoon of cinnamon, and 1/4 cup of caramel sauce or ice cream topping. Set aside. Then take your leftover Snickers bars (2 full-sized bars should work!) and chop up roughly so that you have some bite-sized pieces. Fold gently into the cream cheese dip. Save a few of the fun size for topping your dip. Drizzle the top with a bit more caramel sauce. 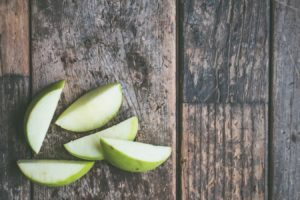 Then, slice up your favorite apple varieties (we love this with tart green ones!) and enjoy by dipping the slices into the dip. This sweet treat can also work great with graham crackers and pretzels if you’re looking for a bit more crunch! BlairCandy.com always has you covered with delicious candy recipes! 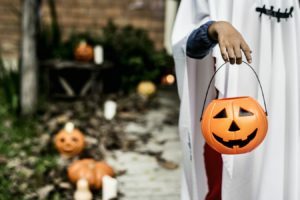 Cool Halloween Candy Jokes Your Kids Will Love! 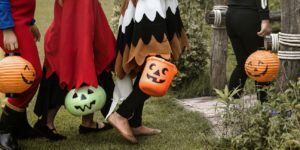 When trick or treating, it’s not uncommon for your friends and neighbors to ask for a joke, a song, a dance, or something fun from your little one before handing out candy. Not to worry! Blair Candy is here to save the day with a few cute Halloween candy jokes you can use while trick or treating this Halloween. What’s a chocolate covered pretzel’s favorite dance? The Twist! Why are ghosts so clever? Because they eat lots of Smarties! What do you call candy that was stolen? Hot chocolate! What do you call a cow that can’t moo? A Milk Dud! What Halloween candy is never on time for trick or treating? Choco-LATE! 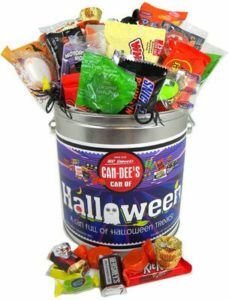 And of course, we can also help with our selection of cool Halloween candy, perfect for handing out to visitors of all ages as they reach your door in costume! For all your Halloween candy and joke needs, visit BlairCandy.com! You may have a big bowl of wrapped Halloween candy ready to go, but are you REALLY ready for those trick-or-treaters? If not, you’re not alone! Sometimes, it’s a bit of a last-minute rush to get everything in place for your neighborhood visitors, but don’t worry – we’re here to help! Be sure to follow this checklist to make your home a hotspot for Halloween activity! ● Clear your walkway from the sidewalk to your home so that it’s safe for trick-or-treaters to get to your door. Walking in masks and costumes is tough enough! ● Pick the best spot for handing out candy. Most people choose their doorway or porch, but if you’ve got a long driveway or a tricky path to the patio, think about setting up a candy stop closer to the sidewalk. Make it fun by turning it into a whole display, complete with spooky decorations! ● Let there be light! Houses that are well-lit are favorites for trick-or-treaters, so make sure your pathways and home are illuminated to let everyone know that you’re accepting knocks (and knock-knock jokes if they have any to tell!). Finally, offer a variety of Halloween candy to suit every taste. Some kids may not like chocolate while others may prefer gummies. A variety can make for some very happy kids in your neighborhood! 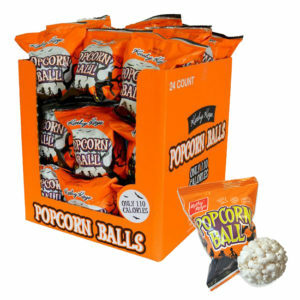 We’ve got you covered there with our huge selection of Halloween candies to choose from on BlairCandy.com! Create Creepy and Fun Candy Bouquets with These Halloween Suckers! Candy bouquets can be a great centerpiece for parties, as they give you the opportunity to turn your decor and favors into one amazing project. At Blair Candy, we carry a large selection of lollipops to help you make the candy bouquet of your dreams, including Halloween-themed pops that are sure to get your favorite ghosts and ghouls smiling this October! ● Cricket Lick-It Lollipops, which include a real cricket encased in a sweet hard candy in a variety of flavors to choose from. ● Candy Corn Halloween Suckers are colorful, fun, and totally on-theme for your Halloween get-together. A favorite from Charms! ● Black and White Twisty Lollipops in a delicious black cherry flavor. Ideal for display at your candy buffet or in a bouquet! To make candy bouquets, all you need are lollipops, a floral foam ball, a vase, and some creativity. Simply insert your lollipop sticks into the foam ball to create a bouquet that looks full and colorful. Don’t have a ball on hand? You can also make bouquets simply by putting your lollipops into appropriately sized vases. Choose several sizes of vase and lollipop to add some variety to your tablescape! Come stock up on BlairCandy.com! Vidal Halloween Gummy Candies Come in All Shapes & Sizes! One of our favorite makers of Halloween gummy candies has cooked up a creative bunch of Halloween-themed gummies just in time for your next boo-tiful bash! For more than 50 years, Vidal has been one of Spain’s most beloved candy makers. In the USA, Vidal gummies are popular for all occasions and Halloween is no exception! ● Ghost and Skull SweeTart-filled Pumpkin Tubes! These are a lot of fun and quite delicious. 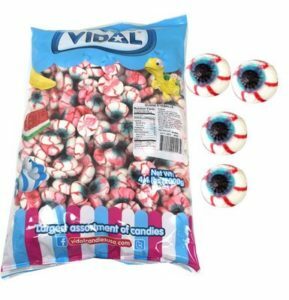 ● Gummy Eyeballs, which are perfect for showcasing with other scary snacks on a party table. You’ll love their look and strawberry cream flavor! ● Black Jack Taffy, in that classic black licorice flavor you love, right alongside a nice orange and black Halloween color scheme! Make Vidal gummies a part of your Halloween festivities by shopping our selection today. 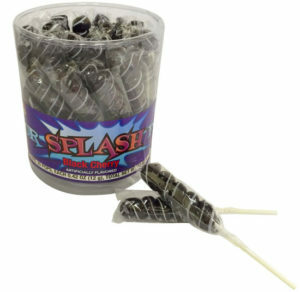 We have these treats and more to choose from in our selection at BlairCandy.com! Leftover Halloween Candy? Make Halloween Candy Trifle! Stuck with lots of leftover candy? We’ve got a sweet solution! Perfect for chocolate lovers with a lot of Halloween candy leftovers, this trifle recipe is a real crowd-pleaser at parties and get-togethers in late October and early November. If you’ve found yourself with extra peanut butter, caramel, or nougat bars wrapped in chocolate, try adding them into this yummy recipe! Start by making a box of your favorite chocolate cake mix (choose your favorite recipe!) and 1 box of instant cheesecake or vanilla pudding according to their package directions. Make sure the cake is fully cooled and the pudding is fully set before taking the next step. In a separate bowl, crumble the prepared cake. Then, in another bowl, fold 1 container of whipped topping into the pudding to make a “mousse.” Refrigerate until ready to use. 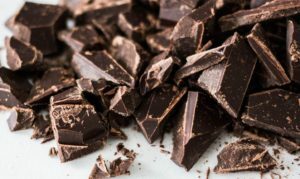 On a cutting board, chop your various chocolate bars or candies. We personally love Reese’s peanut butter cups, Reese’s pieces, M&M’s, Snickers, Milky Way, solid dark chocolate bars, and Kit Kat Halloween candies for this recipe. Set aside. Assemble the trifle by alternating layers of crumbled chocolate cake, mousse, and chocolate candy pieces. Make sure that your last layer is a layer of mousse topped by candy pieces. Drizzle with chocolate or caramel syrup and enjoy! Shop all candy at BlairCandy.com. To make this sweet treat that looks just like a creepy, crawly spider, start by lining a tray with wax paper. 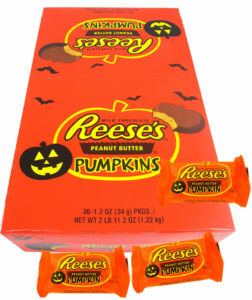 Remove your peanut butter pumpkin candies from their wrappers and line them up on your sheet, making sure to leave a bit of room for the spider’s legs! To make the spider legs, take pretzel twists (large-sized ones work best!) and cut the curved sections so that you have enough for 8 legs on each peanut butter pumpkin body. Next, melt chocolate chips (choose the flavor you like best!) and transfer into a piping bag. Cut off the tip of the bag at the point that’s about 1/4 of an inch from the end. Then, gently pipe the chocolate onto the pretzel legs so that they attach to the pumpkin body. Refrigerate or let the chocolate set before serving. ● Gummi Teeth: This Halloween-themed strawberry gummy is awesome for displaying with other spooky foods at parties. It’ll be right at home next to witch finger sandwiches and jellied eyeballs! ● World’s Largest Gummy Skull: Perfect for displaying at home or in a classroom as a centerpiece, this edible candy masterpiece comes in a variety of flavors. Perfect for sharing! 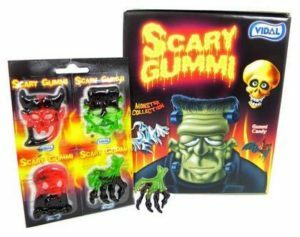 ● Scary Gummi Halloween Creatures: These individual candy packs are great for giving out to trick-or-treaters. Each features a frighteningly delicious assortment of monster gummies. No matter which one you choose, you can’t go wrong with these sweet candies in spooky Halloween shapes!